For years, the simplest and most efficient way to get your idea, concept, or design onto paper was to literally sketch it. However, sketching with handheld, pen-based development tools powered by NVIDIA Quadro adds a layer of interactive depth few can imagine. Combined with applications like Autodesk Sketchbook Pro or Adobe® Illustrator®, what were once flat sketches on paper are now 3D concept models, ready for delivery to product designers, saving significant time. Before a product reaches the marketplace, it passes through innumerable design revisions and improvements. This process is vastly improved by NVIDIA and Industry 4.0, allowing photorealistic model(s) to be viewed in a shared virtual space. Anything, from the interior of a home to the inside of a working engine, can be explored. This level of detail during the development cycle allows for a unified workflow across all departments. While Engineering works on internal details, Purchasing and Supply Chain Management can acquire the necessary materials and present investors, customers or clients with accurate product specifications and depictions. When everyone shares information, no department is left behind. It’s not often that teams can work at the same location, let alone time zones or even continents.. Industry 4.0 capabilities close these divides, and provide a shared digital space for innovators, creators, and visionaries to exchange and enhance ideas. 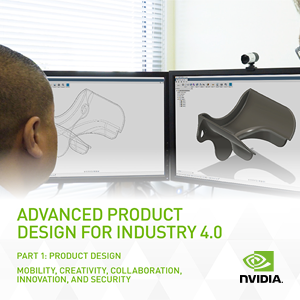 More than advancing technology, NVIDIA and Industry 4.0 seek to change how we work, and the ways we work together.